Everyone is awaiting Apple’s tablet device. Some people (like me) won’t shut up about it. Others (like Paul) won’t shut up about shutting up about it. And while no one is exactly certain what its main use will be, there are no shortage of signs pointing to a definite role as a new way to consume written media. And several old-school publishers seem to be tripping over themselves to get on board the device as print media continues to wither. Personally, I’m excited about the possibility of a resurgence of long-form journalism. And while I’m skeptical as to just how well any device can change our growing collective desire for faster content over better content, I hold out hope because of the way I currently use my Amazon Kindle. The Kindle, while not the Apple Tablet, is an excellent device for doing one thing: reading. And when matched with the super-fast bookmarking service Instapaper, it’s perhaps the ultimate long-form article reader. And an update this week made it ever better. On Monday, Instapaper creator Marco Arment announced that he had significantly upgraded Instapaper’s support for the Kindle. This update made articles saved to Instapaper and transfered over to the Kindle (either wirelessly or by USB-sync) more Kindle-like, which is to say, formatted in a way more much like periodicals are when bought on the device itself. That means that you can now use the Kindle’s buttons to more easily navigate through Instapaper articles you’ve saved to read on the device. Previously, you had to go through a series of rather laborious clicks to reach an article, and even more to get back to the main menu of articles to pick a new one. 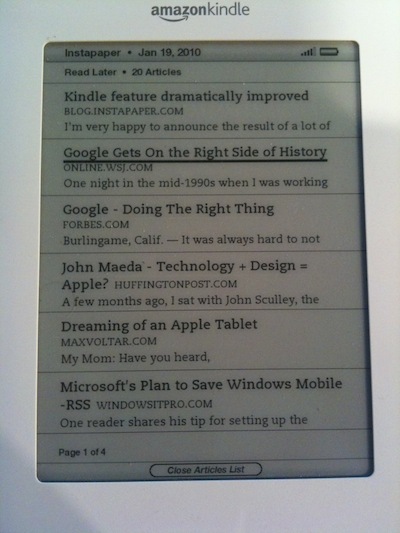 Now, you simply use the Kindle’s stick to navigate forwards and backwards between different articles. (When you’re on a selected article you wish to read, you still use the standard “Prev Page” and “Next Page” buttons to read through them.) There’s also a new “View Sections List” to see a complete table of contents for all the articles you’ve saved to read. Arment also made a change so that only the most recent Instapaper articles are shown on your main Kindle screen, while old ones are moved to a different folder — something which stops a huge amount of clutter on your main screen if you fall behind in your reading (as I often do). Arment notes that with this new formatting and organization, reading Instapaper articles on the Kindle is now he favorite way of consuming them, even beating his excellent iPhone app. And I have to agree. This combination of Kindle + Instapaper is a killer application for the device — and it’s available right now before the Kindle’s official support for apps (announced yesterday) is even in place. If an online article is over a few paragraphs, I now automatically use my Instapaper “Read Later” bookmarklet to save it and send it over to my Kindle for reading when I step away from my computer. And now it’s easier than ever to do that. As I said, this use of the Kindle + Instapaper gives me hope for what Apple can deliver in terms of a reading experience with the tablet. And I see it as proof that the core concept of the tablet-as-a-reader can work. The Kindle will likely retain one big advantage: its e-ink is easier on your eyes (similar to paper) than a backlit screen (much like a computer screen), which the tablet is likely to use. But the tablet will likely offer colorful graphics and interactive elements that the Kindle can’t possibly match. Not to mention that as a touchscreen device, it will almost for sure beat the pants off of the Kindle’s button + stick navigation — just as the iPhone does. Despite the aforementioned announcement of Kindle app support, I find it hard to imagine that the device will ever get anywhere near the type of apps an Apple tablet will likely bring with it. The Kindle is simply too slow and too well, monochrome. I suspect Amazon may change both of those things this year in direct response to not only Apple’s device, but the several other devices that will hit the market this year in time the great tablet war. But for now, the Kindle remains the way to read online content offline. At least until next week, it is the tablet king.